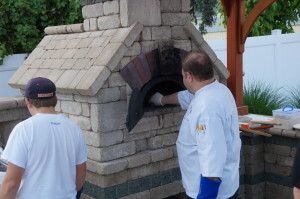 Our Brick Oven Cooking Demo was a great success! 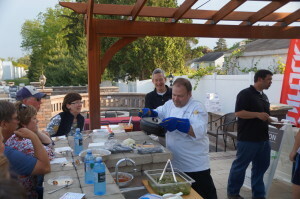 On May 15, Joe Mishler, Executive Chef at Devon Seafood Grill in Hershey, PA put on a cooking demonstration at the Watson Supply warehouse in Harrisburg. 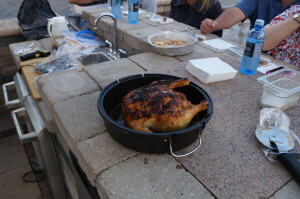 Everything was cooked in a Chicago Brick Oven, which is a wood fired oven that is used outside. The point of the demonstration was to show that wood fired ovens are extremely versatile cooking tools, and tons of fun to use, too. Many people think that wood fired ovens are only good for making pizzas. Wow, did Joe prove THAT wrong! 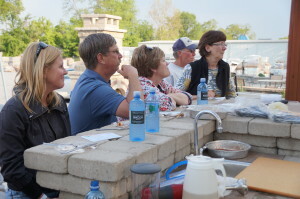 Our guests got to experience first hand how to prepare and cook Blackened Georges Bank Scallops, Herb Roasted Pork Tenderloin, Fire Roasted Asparagus with Toasted Almonds, and Roasted Fingerling Potatoes with Shallots and Fresh Tarragon. Since we had some extra time, we also prepared a dutch oven chicken and a couple of pizzas (which are cooked right on the floor of the oven). who didn't hesitate to share his cooking secrets. 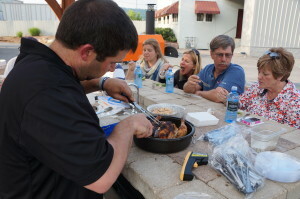 Here is Joe discussing the preparation that went into the chicken. Asparagus makes a great side dish to the Pork Tenderloin. Here is the chicken and the asparagus in the oven, with room to spare. We didn't waste any time digging in. Ready to hit the fire!